Having enjoyed a busy trip in Venice and in Florence, I decided I needed a place to relax. What better place than Cinque Terre? As the name suggests, Cinque Terre is a group of Five Lands: Riomaggiore, Manarola, Corniglia, Vernazza and Monterosso. I stayed in Monterosso, the largest of the villages. Now then, when I say largest, don’t think Monterosso is actually large. Monterosso is made up of an old town and a new town, both of which you can walk end-to-end in just minutes. Monterosso, like the other five villages, is a beach town. It doesn’t have a lot of ancient monuments or famous art museums. It has a beach and a laid-back vibe. But that’s the exact reason to go there. Travel is exciting, but tiresome. You need a place to unwind at the end of your trip. Like a pristine, tropical getaway, the water is warm and bluer than the very concept of blue itself. You can lie back in the sun, read a book, and work on your tan. Or if you’d like, you can swim a short distance from shore to jump off a small outcrop of rocks. 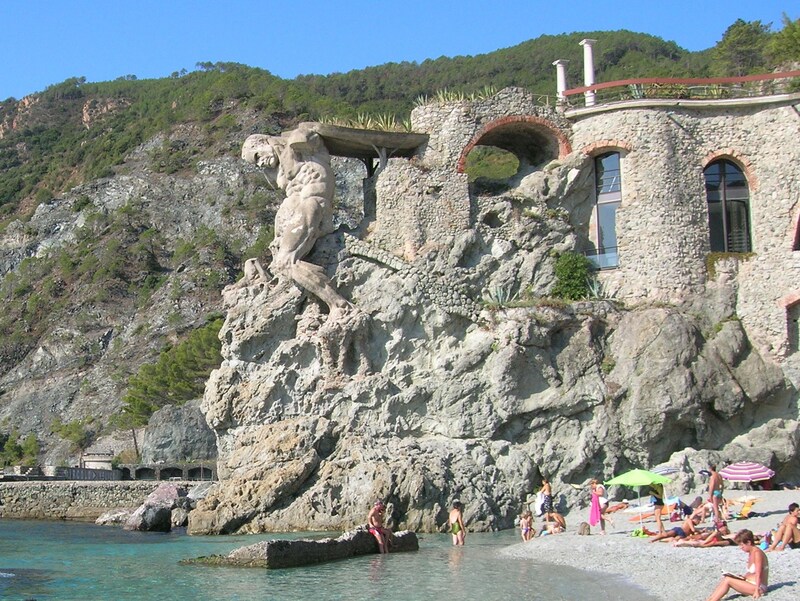 All the while, Il Gigante, a giant statue of Neptune holding back the waves, watches over the beach. Il Gigante has since lost his arms, but he’s still a cool sight. If you’re looking for some shopping, head over to the old town. You’ll find several shops with clothing, soap, lemon treats, and traditional cookware. At the very least, you can walk around and enjoy the architecture. Then you can stop to munch on some focaccia. The whole place is obsessed with it. When it comes time for dinner, there are plenty of restaurants in old town with picturesque views from which you can watch the sun set. It certainly makes for a romantic evening. But, if you’re stopping in Monterosso, you absolutely must visit Miky Ristorante. Miky is a 1 Michelin Star restaurant that to this day has given me one of the best meals of my life. Everything on the menu is expertly crafted and beautifully prepared. I would recommend a specific dish to you, but they’re all good. Miky’s reviews are splattered with comments like “Try the pasta with pesto. You won’t regret it.” “The beef cheeks are to die for.” “You must have the octopus.” Whatever you get, you will love it. For the more active types, there are trails that connect each village of Cinque Terre. They stretch up into the mountains where you get the most beautiful views in all of Italy. At the start of the trail, you will have to buy a ticket for the trail, and if you want, for the train. Do yourself a favor and buy a ticket for the trail and the train. Once you finish the trail, you’ll be too tired to walk back. You’ll want the train. My brother and I walked from Monterosso to Vernazza and then from Vernazza to Corniglia. All in all, we walked 8 miles and climbed 150 floors. It’s a hell of a workout, but take a look at the photos and you tell me…was it worth it?